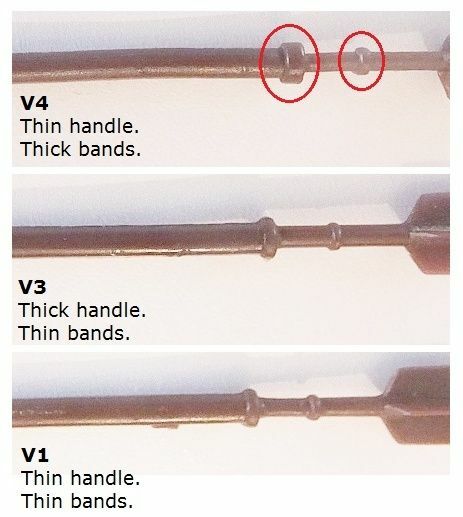 I would've guessed at an original Variant 1 (found on here: http://www.imperialgunnery.com/otherweapons.htm) except that it has an injection mark on the "fletching" looking end (right hand side of second picture) which is not in the TIG image and that the neck where it curves looks a little longer and remains the same width at the rest of the main part of the stick. What does it look like to you? another original variation or a very good new repro? it came with an authentic and complete HK COO figure. It looks good from the photo. Good spot on the EPM. Can you check if it floats please? 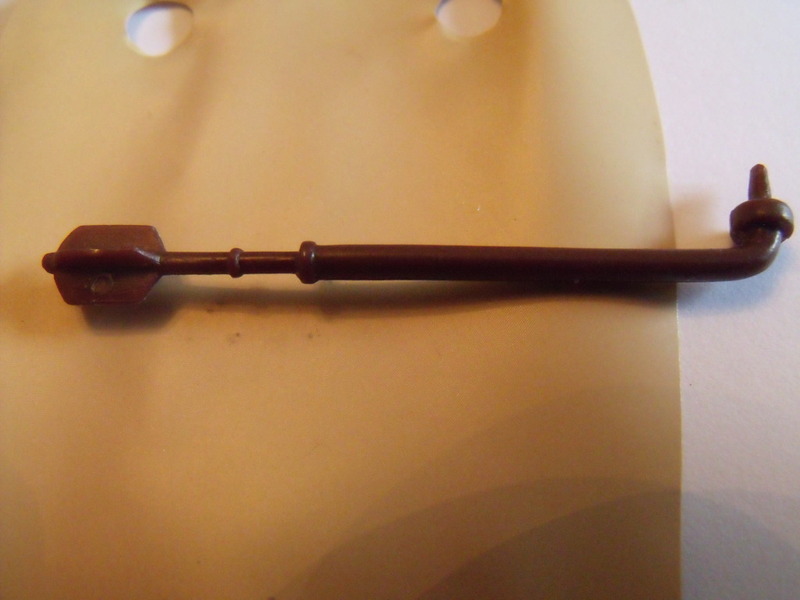 We have a couple of other Gaffi sticks we're looking at so might be able to compare and make an update soon. Thanks for your reply. Yes it does float, even when you keep bobbing it underwater it always comes back to the surface. If you need better high definition images for your weapon validation pages then I can provide them - just let me know. 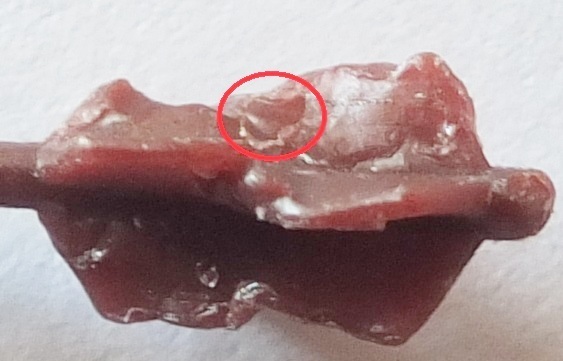 Your site has been invaluable when trying to identify this stuff. It is not V1, we have somehow missed that version. Note most gaffi sticks have a radiused transition from the round disc bit to the cone tip. 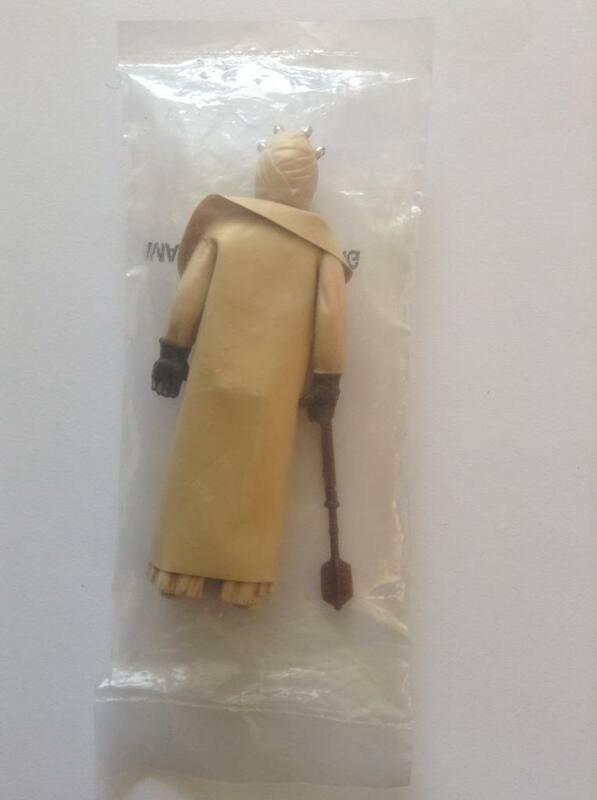 I have the same gaffi stick here and also one in my SW-d Baggie, pics are a bit rubbish but it looks to me like this factory started with the EPMs on there Tusken sticks but latter amended there Mould to produce a better looking alternative. I also found the same one as Mat8yr among the three I checked today. 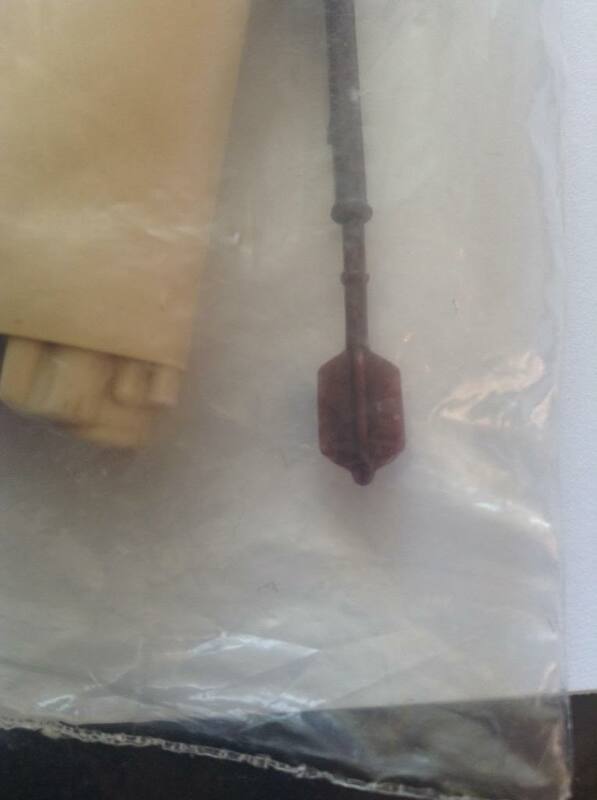 It has the slightly longer and same width curve part and an EPM on the fletch, same as Scott's. The fletching part of mine is chewed but you can still see the EPM. I'll post some pics tomorrow. Mine also has a 'wide' and 'flat' radial part from the disc to the cone as AJ mentioned and looks the same as Mat8yr's. Scott, does yours have the long or short 'curve' ? Our current V3 also has an EPM on the fletch but has the shorter and thicker curve part. So with that said I would say the version Mat8yr has shown us could be designated as a V4 and added to the guide. Here is the beater Gaffi stick that is the same as Mat8yr's. Note the long curve part and thin, flat disc. The fletching is chewed but you can still make out an EPM. I also noticed my V3 is the same colour as others when the guide states they are a more reddish brown colour. No mention of an EPM either so will update this entry too. The other thing to note on the new V4 are the bands on the handle are bigger than other versions. @Mat8yr - I've added your pics to the guide and made some updates. Thanks for bringing this to our attention. Paul from the pictures it looks like on this version 4 the thin part between the thick handle and the fletching is longer, making the whole staff slightly longer. It appears to be long on the ops also but he doesn't have others in the pic with his. Is this a tell also for this variant? Good spot Bryan and it looks this way from the pics, but I checked the length of the handle parts and the overall length and there is no difference. I never realised Mat8yr's was a different variant to mine guys so thanks for pointing it out, I just presumed it was a V3 like the two I have because of the EPM but looking at them all again now I can see it looks more squared off compared to mine and it also has the longer bit around the curve. It would also be very interesting to see if theres other gaffi stick's out there with the long bit after the curve but without any EPM's. I'm not sure wether these where off the same spree and produced at the same time or not but there quite a bit different to each other visually, compared to the other slight different accessory variants that we know about so worth a slot on the gunnery IMO. Paul, Whilst we're on the subject and your thinking of adding this to the guide, what's the difference between the V1 and V2 on the gunnery? I was just having a look and Is it just the colour because if so, to keep these inline with the blasters etc we should change them to the same V2 brown and V2 dark brown variants. V3 which I think is from the same factory but earlier produced as you can see from my Baggie would become V1 and this new variant would be a V3. 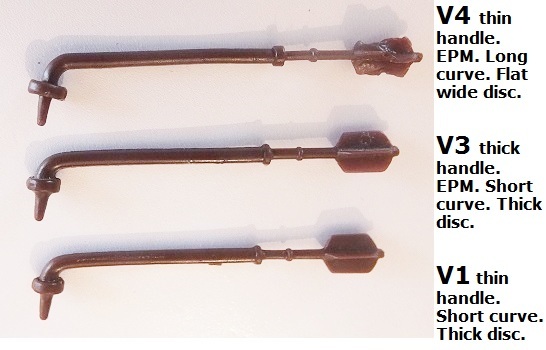 All 3 of those variants on the gunnery now are from the same Mould tool or spree and it shows us that the factory making this accessory was changing the materials, colour of the plastic as they went. Scott, I've never seen a V2 in hand but yes on the colour and the handle is thicker. Shame there is not a comparison pic with a thinner handle and lighter version, but the handle does look thicker from the pic. As always- great job with the update, I may have a darker (V2?) so shall dig it out for comparison pics.